The restoration crew has started to hang shutters on the exterior of the house. Rear of the house, from the Architectural Record, Vol VI (July 1896-June 1897). 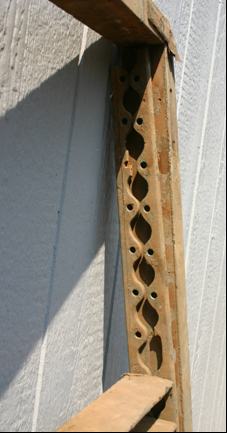 Most of the surviving shutters have standard, fixed-position slats, but two of them had moveable slats. These moveable shutters date to 1810-1812, and would have been mounted on the tall, triple-sash windows of the Drawing Room (M108). The “moveable venetian blinds” have slats which are mounted to two pieces of wood which have wavy edges. One piece of the wood, the one which would have been closest to the wall, is fixed, and the wavy edges allow the other piece to slide up and down. The slats themselves are attached with pegs, which allows them to shift as the moveable piece slides. The pictures below show new shutters waiting to be hung and the venetian blinds hung on the Drawing Room windows. We will post an update with photographs once all the shutters are hung, for those of you unable to come and see them for yourselves. This entry was posted on Wednesday, April 29th, 2009 at 7:28 am and is filed under Restoration1. You can follow any responses to this entry through the RSS 2.0 feed. You can leave a response, or trackback from your own site. This is amazing detective work! Good show! Thanks so much for your persistent attention to accurate details. Thank you! We are doing our best to be as accurate as we can in all phases of the restoration, which means that keeping an eye on details is part of the job.